In my perhaps biased view, Berkshire has the best large insurance operation in the world. And I will absolutely state that we have the best managers. Our float has grown from $16 million in 1967, when we entered the business, to $62 billion at the end of 2009. Moreover, we have now operated at an underwriting profit for seven consecutive years. I believe it likely that we will continue to underwrite profitably in most – though certainly not all – future years. If we do so, our float will be cost-free, much as if someone deposited $62 billion with us that we could invest for our own benefit without the payment of interest. Let me emphasize again that cost-free float is not a result to be expected for the P/C industry as a whole: In most years, premiums have been inadequate to cover claims plus expenses. Consequently, the industry’s overall return on tangible equity has for many decades fallen far short of that achieved by the S&P 500. Outstanding economics exist at Berkshire only because we have some outstanding managers running some unusual businesses. For many years I had struggled to think of side products that we could offer our millions of loyal GEICO customers. Unfortunately, I finally succeeded, coming up with a brilliant insight that we should market our own credit card. I reasoned that GEICO policyholders were likely to be good credit risks and, assuming we offered an attractive card, would likely favor us with their business. We got business all right – but of the wrong type. Our pre-tax losses from credit-card operations came to about $6.3 million before I finally woke up. We then sold our $98 million portfolio of troubled receivables for 55¢ on the dollar, losing an additional $44 million. GEICO’s managers, it should be emphasized, were never enthusiastic about my idea. They warned me that instead of getting the cream of GEICO’s customers we would get the – – – – – well, let’s call it the non-cream. I subtly indicated that I was older and wiser. In earlier days, Charlie and I shunned capital-intensive businesses such as public utilities. Indeed, the best businesses by far for owners continue to be those that have high returns on capital and that require little incremental investment to grow. We are fortunate to own a number of such businesses, and we would love to buy more. Anticipating, however, that Berkshire will generate ever-increasing amounts of cash, we are today quite willing to enter businesses that regularly require large capital expenditures. We expect only that these businesses have reasonable expectations of earning decent returns on the incremental sums they invest. If our expectations are met – and we believe that they will be – Berkshire’s ever-growing collection of good to great businesses should produce above-average, though certainly not spectacular, returns in the decades ahead. The major problem for Berkshire last year was NetJets, an aviation operation that offers fractional ownership of jets. Over the years, it has been enormously successful in establishing itself as the premier company in its industry, with the value of its fleet far exceeding that of its three major competitors combined. Overall, our dominance in the field remains unchallenged. NetJets’ business operation, however, has been another story. In the eleven years that we have owned the company, it has recorded an aggregate pre-tax loss of $157 million. Moreover, the company’s debt has soared from $102 million at the time of purchase to $1.9 billion in April of last year. Without Berkshire’s guarantee of this debt, NetJets would have been out of business. It’s clear that I failed you in letting NetJets descend into this condition. But, luckily, I have been bailed out. We told you last year that very unusual conditions then existed in the corporate and municipal bond markets and that these securities were ridiculously cheap relative to U.S. Treasuries. We backed this view with some purchases, but I should have done far more. Big opportunities come infrequently. When it’s raining gold, reach for a bucket, not a thimble. We entered 2008 with $44.3 billion of cash-equivalents, and we have since retained operating earnings of $17 billion. Nevertheless, at yearend 2009, our cash was down to $30.6 billion (with $8 billion earmarked for the BNSF acquisition). We’ve put a lot of money to work during the chaos of the last two years. It’s been an ideal period for investors: A climate of fear is their best friend. Those who invest only when commentators are upbeat end up paying a heavy price for meaningless reassurance. In the end, what counts in investing is what you pay for a business – through the purchase of a small piece of it in the stock market – and what that business earns in the succeeding decade or two. We have long invested in derivatives contracts that Charlie and I think are mispriced, just as we try to invest in mispriced stocks and bonds. Indeed, we first reported to you that we held such contracts in early 1998. The dangers that derivatives pose for both participants and society – dangers of which we’ve long warned, and that can be dynamite – arise when these contracts lead to leverage and/or counterparty risk that is extreme. At Berkshire nothing like that has occurred – nor will it. It’s my job to keep Berkshire far away from such problems. Charlie and I believe that a CEO must not delegate risk control. It’s simply too important. At Berkshire, I both initiate and monitor every derivatives contract on our books, with the exception of operations-related contracts at a few of our subsidiaries, such as MidAmerican, and the minor runoff contracts at General Re. If Berkshire ever gets in trouble, it will be my fault. It will not be because of misjudgments made by a Risk Committee or Chief Risk Officer. Our subsidiaries made a few small “bolt-on” acquisitions last year for cash, but our blockbuster deal with BNSF required us to issue about 95,000 Berkshire shares that amounted to 6.1% of those previously outstanding. Charlie and I enjoy issuing Berkshire stock about as much as we relish prepping for a colonoscopy. The reason for our distaste is simple. If we wouldn’t dream of selling Berkshire in its entirety at the current market price, why in the world should we “sell” a significant part of the company at that same inadequate price by issuing our stock in a merger? In evaluating a stock-for-stock offer, shareholders of the target company quite understandably focus on the market price of the acquirer’s shares that are to be given them. But they also expect the transaction to deliver them the intrinsic value of their own shares – the ones they are giving up. If shares of a prospective acquirer are selling below their intrinsic value, it’s impossible for that buyer to make a sensible deal in an all-stock deal. You simply can’t exchange an undervalued stock for a fully-valued one without hurting your shareholders. Imagine, if you will, Company A and Company B, of equal size and both with businesses intrinsically worth $100 per share. Both of their stocks, however, sell for $80 per share. The CEO of A, long on confidence and short on smarts, offers 11⁄4 shares of A for each share of B, correctly telling his directors that B is worth $100 per share. He will neglect to explain, though, that what he is giving will cost his shareholders $125 in intrinsic value. If the directors are mathematically challenged as well, and a deal is therefore completed, the shareholders of B will end up owning 55.6% of A & B’s combined assets and A’s shareholders will own 44.4%. Not everyone at A, it should be noted, is a loser from this nonsensical transaction. Its CEO now runs a company twice as large as his original domain, in a world where size tends to correlate with both prestige and compensation. In our BNSF acquisition, the selling shareholders quite properly evaluated our offer at $100 per share. The cost to us, however, was somewhat higher since 40% of the $100 was delivered in our shares, which Charlie and I believed to be worth more than their market value. Fortunately, we had long owned a substantial amount of BNSF stock that we purchased in the market for cash. All told, therefore, only about 30% of our cost overall was paid with Berkshire shares. In the end, Charlie and I decided that the disadvantage of paying 30% of the price through stock was offset by the opportunity the acquisition gave us to deploy $22 billion of cash in a business we understood and liked for the long term. It has the additional virtue of being run by Matt Rose, whom we trust and admire. We also like the prospect of investing additional billions over the years at reasonable rates of return. But the final decision was a close one. If we had needed to use more stock to make the acquisition, it would in fact have made no sense. We would have then been giving up more than we were getting. I have been in dozens of board meetings in which acquisitions have been deliberated, often with the directors being instructed by high-priced investment bankers (are there any other kind?). Invariably, the bankers give the board a detailed assessment of the value of the company being purchased, with emphasis on why it is worth far more than its market price. In more than fifty years of board memberships, however, never have I heard the investment bankers (or management!) discuss the true value of what is being given. When a deal involved the issuance of the acquirer’s stock, they simply used market value to measure the cost. They did this even though they would have argued that the acquirer’s stock price was woefully inadequate – absolutely no indicator of its real value – had a takeover bid for the acquirer instead been the subject up for discussion. I can’t resist telling you a true story from long ago. We owned stock in a large well-run bank that for decades had been statutorily prevented from acquisitions. Eventually, the law was changed and our bank immediately began looking for possible purchases. Its managers – fine people and able bankers – not unexpectedly began to behave like teenage boys who had just discovered girls. They soon focused on a much smaller bank, also well-run and having similar financial characteristics in such areas as return on equity, interest margin, loan quality, etc. Our bank sold at a modest price (that’s why we had bought into it), hovering near book value and possessing a very low price/earnings ratio. Alongside, though, the small-bank owner was being wooed by other large banks in the state and was holding out for a price close to three times book value. Moreover, he wanted stock, not cash. Yes, the merger went through. The owner of the small bank became richer, we became poorer, and the managers of the big bank – newly bigger – lived happily ever after. Markets aren't efficient. Academics refuse to jettison the efficient market hypothesis, despite evidence of its role in the recent crisis. As the 11th Circuit Court of the United States wrote in a recent opinion, "All bubbles eventually burst, as this one did. The bigger the bubble, the bigger the pop. The bigger the pop, the bigger the losses." Relative performance is a dangerous game. Like the efficient market hypothesis, its offspring the capital asset pricing model also rests on flawed assumptions. It commits fund managers to relative performance rather than absolute performance, which leads them to follow market weightings when picking stocks rather than their own good ideas. The time is never different. Bubbles are identifiable before they burst, and knowledge of the history of bubbles can help preserve capital. Each bubble inflates and bursts in five phases, identified by John Stuart Mill in 1867: Displacement, credit creation, euphoria, financial distress and revulsion. Valuation matters. The principles of value investing tell us to buy when the market is cheap and sell when the market is expensive. This means, however, that we must be prepared to not be fully invested when equity prices are unattractive. Wait for the fat pitch. The average holding period for a stock on the New York Stock Exchange is six months. This myopia creates opportunities for investors who are willing or able to act on a longer time horizon and wait for the "fat pitch" - the time when valuation figures are just right. Sentiment matters. Market sentiment swings like a pendulum from irrational exuberance to despair. It therefore pays to be a contrarian investor. Young, volatile, unprofitable "junk" firms generate the best returns when sentiment is low. Mature, low volatility, profitable "quality" firms produce the best results when sentiment is high. Leverage can't make a bad investment good, but it can make a good investment bad! Adding leverage onto an investment with small returns doesn't turn it into a good idea. Leverage can limit staying power, and can turn temporary impairment into a permanent impairment of capital. "Financial innovation" is usually just thinly veiled leverage. Over-quantification hides a real risk. Risk is not volatility. Rather, risk is the permanent loss of capital. We would be better off abandoning out obsession with measurement and instead focus on the three main paths to permanent loss of capital: Valuation risk (buying an overvalued asset), business risk (fundamental problems) and financing risk (leverage). Macro matters. Ignoring the top-down view of the markets can be incredibly expensive. The credit crisis showed precisely how a top-down view of the markets can inform and enrich a bottom-up perspective. Investors who understood the impact of the bursting of the bubble avoided financials, while those who focused on the bottom-up saw cheapness, but missed the value trap resulting from the bursting credit bubble. Look for sources of cheap insurance. Insurance is often a neglected asset. Insurance virtually guarantees short-term losses, but also provides a big payout if an event occurs. It is best to avoid purchasing insurance right after an event occurs, because that is when it is most expensive. It took a parable from Charlie Munger to finally get me to watch this interview that has been saved on my DVR since October, but it was one of the better interviews I have ever seen and I highly recommend it. (And H/T to Shai, who was well ahead of me on getting it posted). To watch it now, you actually need to go to the Charlie Rose Home Page, click on the 'Recent Shows' tab, and then scroll down to the interview from 10/23/09. CHARLIE ROSE: What’s the most important change and significant change in your way of thinking about the world over the last 20 years? LEE KUAN YEW: No, it is not clear when it will happen, but that it will happen now in the long term, 50 to 100 years, yes. Berkshire Hathaway CEO Warren Buffett and Salida Capital CEO Courtenay Wolfe weigh in on the annual charity auction that awards the highest bidder a lunch with Buffett. I’m a little late posting this, but better late than never. On the broader issue of supporting a growing population, it has historically been true (and is likely to continue to be true even in the event of further credit strains) that the needs of the U.S. population can be supported through productivity growth and to some extent by importing the output produced by cheaper foreign labor. In the long run, productive investment is the cornerstone of economic stability. Over the past decade we have greatly threatened that that stability through the ridiculous misallocation of resources in speculative bubbles and unproductive "investments," but I am convinced that we will re-learn, painfully or otherwise, to better allocate our resources. My impression continues to be that the current deleveraging cycle will likely be a multi-year process that is presently far from complete. Foreign trade can also be the source of mutual economic benefit, but only if it ultimately improves the allocation of resources. On our current path, we have instead relied on cheap imports from China and other countries while at the same time destroying our own capital through poorly allocated speculative investments, followed by bailouts to the lenders who provided that capital. The only plausible outcome of that dynamic is that foreigners will gradually acquire claims on our nation (Treasury debt or private securities), and with them, the ability to acquire our productive assets. No doubt many analysts on the financial channels will gurgle with excitement every time a foreign acquirer bids for ownership of a U.S. company, but this is how we will pay for our the difference between our consumption and our income. Again though, I am convinced that we will ultimately re-learn to better allocate our resources. Thanks to Ian for passing this along. Lately I have seen a few suggestions, here and there, that the United States should consider inflating its way out of its rising debt burden. The country essentially inflated its way out of much of its debt during the Great Depression, and again in the 1970s, according to Harvard’s Kenneth S. Rogoff. But as anyone who remembers the 1970s can attest, inflation can be painful. It’s no fun to get your paycheck and then find out that you cannot buy as many groceries or as much gasoline as you did the week before because prices have gone up so much. The more powerful argument against inflating away debt is that it will not work, says Alan Auerbach, an economics professor at the University of California, Berkeley. Sudden inflation can only inflate away the debt that is (1) not indexed, the way TIPS are; and (2) not very short term (i.e., not T-bills), so that the interest rates cannot be reset to much higher rates that would compensate for inflation. Also, there is no net gain to inflating away debt held within the government (e.g., the Social Security trust fund, etc.). So, as of the end of November (data from the Treasury Web site; probably can be updated through December now), that left about $5.4 trillion worth of debt that could be made to disappear with a sudden, rapid inflation. But most of our long-term imbalance, which Bill Gale and I have estimated at $53-$126 trillion (in our paper published in Tax Notes in October), depending on how far out one looks, comes from exploding entitlement programs, which are either explicitly indexed to inflation — Social Security — or implicitly indexed (Medicare and Medicaid) because they provide services that will also grow in cost with inflation. So the best we could do, using the lower estimate of the long-term gap (a 75-year number) would be to eliminate 5.4 of 53 trillion, or about 10 percent. In other words, even if the government printed a lot more money and lowered the purchasing power of the dollar, 90 percent of the country’s debt problem would survive. So what are the other strategies for bringing down the country’s long-term deficits? The one countries always hope for is growth. If the economy grows quickly enough, tax revenues can rise faster than spending. This helps explain why the country had budget surpluses in the late 1990s and early 2000s. A booming economy — greased by the stock bubble, of course — helped push tax revenues even higher than the government had expected they would be. But the grow-your-way-out-of-debt option is usually too rosy, especially during a recession. 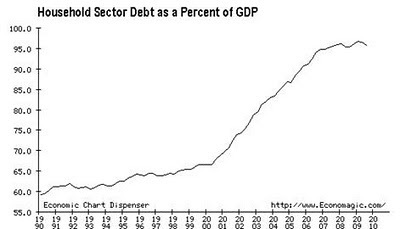 A country loaded with debt can try to simply tighten its belt, by raising tax revenues and/or slashing spending. But there are major political obstacles for these policy initiatives because they are so painful, at least in the short-run. Finally, a country can restructure its debt or default, which is generally considered the worst-case. Just as a person defaulting on a loan can mar his ability to borrow in the future or even get a job, a country defaulting on its debt obligations will have trouble getting other nations and investors to trust it in the future, too.